-build in near hundred game codes. -allow saving of new game codes. 1M / 4M expansion RAM card. Allow US / JAP / EUR games to be run on all version of Sega Saturnâ„¢. 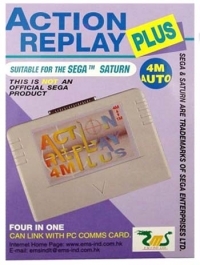 05-04-2013 vigorousjammer Box Text Suitable for the Segaâ„¢ Saturn 3 in 1 Action Replay + 4M memory card + 1M/4M expansion RAM card = Action Replay Plus 4M Action Replay -build in near hundred game codes. -allow saving of new game codes. 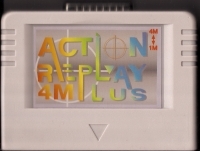 4M memory card. 1M / 4M expansion RAM card. Allow US / JAP / EUR games to be run on all version of Sega Saturnâ„¢. 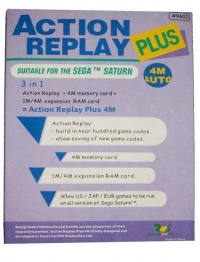 This is a list of VGCollect users who have Action Replay 4M Plus in their Collection. This is a list of VGCollect users who have Action Replay 4M Plus in their Sell List. This is a list of VGCollect users who have Action Replay 4M Plus in their Wish List.